Fantastic theme! Thank you! I have one little need and very poor php skills. I want Pages and the top navigation bar to show only parent pages, and only show children pages when viewer clicks on the parent page. If you look at my site (www.hungrytravelers.com) you’ll see a parent page called recipes. I want to put links there to recipes but not have their titles display as drop-downs. I think the code is something like but I don’t know where to put it! I really like the yashfa theme, but I would like to remove the RSS button from the headers so that I can track subscribers through feedburner. How can I remove the RSS button from the header? The theme is great, but I can’t get the color of the text to change on the main page, it changes in the preview (from white to black) but when I “save” it doesn’t show up. Can you help? How do I reverse the day/month order to month/day in the recent posts widget at the bottom. How do I add year? I checked the different css and php files but the code area didn’t jump out at me. This is a great theme by the way. For a free theme it looks great out of the box. Hey. I am using this theme. I like it. I cannot figure out how to add my Twitter feed to the sidebar. Could you please tell me how to do that? Thank you. great theme! i’m having problems changing the favicon.ico. i’ve removed the default .ico from /blog/wp-content/themes/yashfa but the .ico doesn’t update. please help. thanks. Been using this theme for a while and I love it! I’m trying to add the slickr gallery to my blog but the lightbox images load behind the header (hhtp://sabatica.cat/fotos). Any clues on how to fix this? After fiddling with it for a while I got it! Just change the z-index under #header from 499 to 0 in the style.css. I have not edited the image.php file at all. Any ideas? 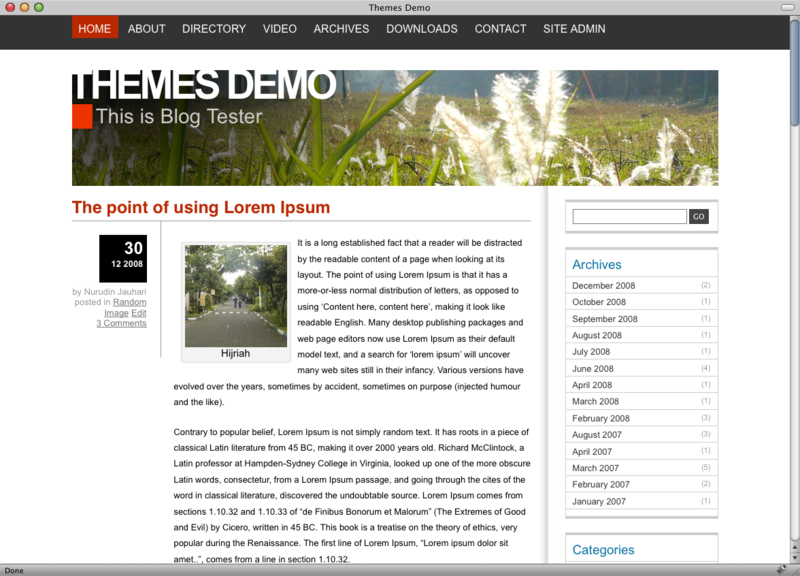 I love this theme, I have it implemented on my site… but I really need you to make a BBPRESS version! How much would something like that cost if I was willing to pay for it? Great site. Thank you for your themes & plugins. Yashfa is a great theme right out of the box. Thank you so much for creating it! Is there any way to add space between the paragraphs in the comments? I’ve tried adding margin-bottom: 1.0em; in the .comment style of css-comment.css. It *should* work, but it doesn’t seem to. Can you help? I am using and love your Yashfa theme. Thanks for the work on this. I find it easy to use and flexible, but I have just have one question – how do I hide/show the about the author box in the posts? Is that possible? I have looked through all the admin settings and I don’t know where this feature is pulling from in the theme/admin settings? For instance the image box is blank and I don’t know where it wants to pull from. I think I may just hid the whole thing if that’s possible. But the “Post by” link in the left near the date doesn’t link to anything. Can you just tell me how to control this if it’s possible. I hae add the fr_FR.po file in the language folder but nothing is getting translate…..Is there a twist somewhere ? Can you please help me ? And If you want it, I don`t mind sending you my fench file….Let me know! This is very awkward sounding and I’m not sure how to change this text. Never used wordpress before…have chosen to download Yashfa…I love it – clean and easy to tweak and personalise for a novice. Only problem I’ve had is the rss comments – it doesn’t seem to work. According to “http://codex.wordpress.org/Template_Tags/comments_rss_link” the code no longer works. New code is “http://codex.wordpress.org/Function_Reference/post_comments_feed_link” Any advice where and how to make the appropriate adjustments to the code. Many thanks.